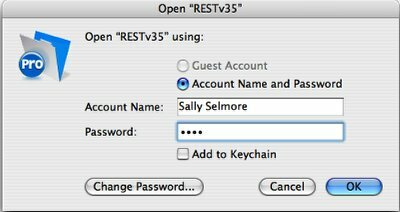 Launch REST and open with your Owner-level User Name and Password. This is dialog box confirms your login. Navigate to your Preferences screen. 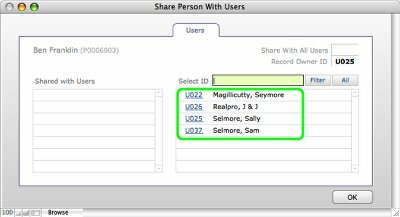 User hierarchy sharing is automatic - Users access records in their "Entire Group"
Record Sharing is dynamic; available on a record-by-record basis. 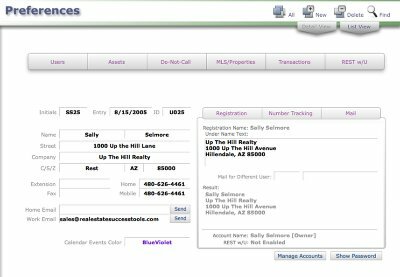 Select individual Users and grant them access to a specific record. Also includes "Share with All Users" options. 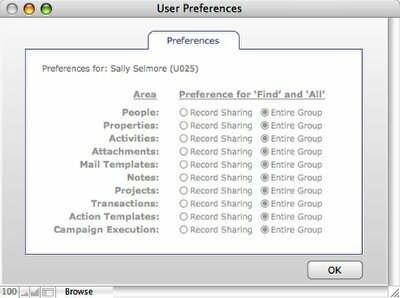 In Preferences, select from the REST Utilities menu Record Sharing > Share Record (or use the keyboard shortcut control-r for Windows and command-r for Macintosh). The default Sharing Preference for each area of REST is "Entire Group". 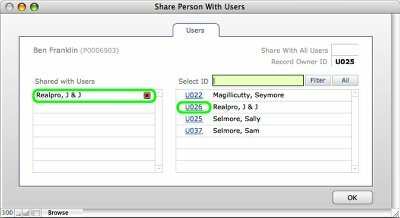 Preference selections here will effect what records Users will view by default as they move around REST. These preferences effect the "All" and "Find" Buttons. Alt-click (WIN) or Option-click (MAC) toggles between "Entire Group" and "Record Sharing"
Tooltip over the "All" button. Option-click (Macintosh) Alt-click (Windows) to toggle your Record Sharing/Entire Group preference. Tooltip over the "Find" button. From the REST Utilities Menu choose Record Sharing in any area of REST (or use the keyboard shortcut control-r for Windows and command-r for Macintosh). 1. 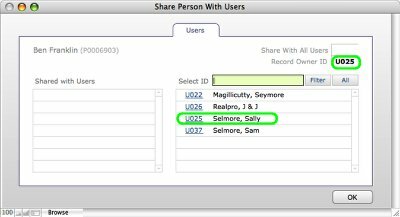 The Record Owner ID field indicates that Sally Selmore is the owner of People record "Ben Franklin". 2. This list on the right shows the other Users that you can share this People record with. Click on the User's ID # from the list of Users. That user now has access to this record. Repeat for any additional users. Click in the "Share With All Users" field and choose "Yes". TIP: This is a great feature for sharing vendors with other team or office members. 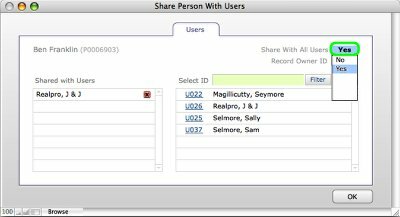 Click on the People Group tab on any People record. 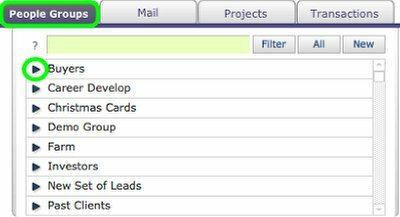 Then click on the "blue arrow" pointing to the People Group name you want to share with other Users. Select from the REST Utilities menu Record Sharing > Share Record (or use the keyboard shortcut control-r for Windows and command-r for Macintosh). Click on the "Mail navigation button.